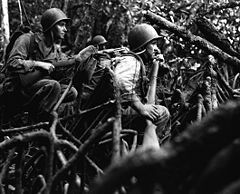 G.I.s from the 25th Infantry Division in the jungle of Vella Lavella during Operation Cartwheel (13 September 1943). G.I. are initials used to describe the soldiers of the United States Army and airmen of the United States Army Air Forces and also for general items of their equipment. The term G.I. has been used as an initialism of "Government Issue" or "General Issue", but it originally referred to "galvanized iron", as used by the logistics services of the United States Armed Forces. During World War I, American soldiers sardonically referred to incoming German artillery shells as "G.I. cans". Also during that war, "G.I." started being interpreted as "Government Issue" or "General Issue" for the general items of equipment of soldiers and airmen. The term "G.I." came into widespread use in the United States with the start of the Selective Service System ("the draft") in 1940, extending into 1941. It gradually replaced the term ”Doughboy” that was used in World War I. Next, the use of "G.I." expanded from 1942 through 1945. American five-star General Dwight D. Eisenhower said in 1945 that "the truly heroic figure of this war [is] G.I. Joe and his counterpart in the air, the navy, and the Merchant Marine of every one of the United Nations." "G.I." was also used as an adjective for anything having to do with the US Army or Army Air Force. They Called Me Joe was a series of radio dramas aired in 1944. Each episode focused on a different fictional American soldier. A solder of a different national or ethnic origin was selected for each episode, but he was always identified as a G. I. named Joe. The series was intended to encourage Americans of varying backgrounds to cooperate to win World War II. It was produced by the NBC University Theatre of the Air, which also produced a series The World's Great Novels. The series had ten episodes and they aired both on the NBC Radio Network and the Armed Forces Radio Network. ”G.I. Joe”, an action figure, was introduced by Hasbro in 1964. Its name comes from the term used to describe soldiers during the war. In British military parlance and in armed forces modelled on British military traditions, G.I. refers to a Gunnery Instructor (generally an NCO responsible for inducting and training recruits). G.I. Joe – a line of action figures produced and owned by the toy company Hasbro. ^ Rawson, Hugh (April – May 2006). "Why do we say "G.I."?". American Heritage. Archived from the original on 29 August 2008. ^ a b Wilton, Dave (2 February 2009). "G.I. - Wordorigins.org". Wordorigins.org. ^ "GI – Definitions from Dictionary.com". Dictionary.com Unabridged. Random House, Inc.
^ Eisenhower, Dwight D. (10 May 1945). Funeral Pyres of Nazidom. Universal Newsreel. ^ Rivas-Rodriguez, Maggie. "A Soldier's Story: World War II and the Forgotten Battle for the Aleutian Islands". KUT (radio station). Retrieved 29 September 2018. Look up GI in Wiktionary, the free dictionary.